One of the first things I did when finding out I was having twins (who are now THREE by the way), was start stressing. It was not so great for the babies, but how could I not when my life had been so dramatically changed in just a few moments with the upward swipe of an ultrasound wand? I worried about my ability to care for two human beings and whether or not I would mess them up more than I would have a singleton. I thought constantly about the future and how we would clothe and feed them, how I would handle the inevitable sibling rivalry and whether or not CJ and I would survive this as a couple. And then there was the added worry and guilt over ensuring that each one felt completely loved and supported 100% of the time – but knowing that would be nearly impossible. There were times along this three year journey where I felt totally alone. All the moms I know are amazing, but none have twins and I often wondered if I was the only one with such intense fears or who really struggled to get back on their feet after a crazy pregnancy, NICU time and breastfeeding issues. I am thankful for social media and twin mom groups, usually my go-to for advice, but most recently, I had the opportunity to read a fantastic collection of stories written by other parents of multiples and it was quite the eye-opening and reassuring experience. 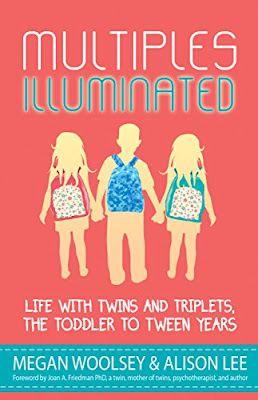 Multiples Illuminated: Life with Twins and Triplets, the Toddler to Tween Years, the second book in a series, is edited by fellow moms of multiples, Megan Woolsey, a mom of four including 9 year old triplets, and Alison Lee, a mom of four including 3 year old twins. This compilation of 21 colorful anecdotes, honest admissions and helpful tips for multiples aged two to twelve, is a must-read for any multiples parent or parent to be. Each story is the perfect mix of raw, relatable and reassuring. Even the most anxious parents of multiples will feel a sense of relief in knowing that at least one other person out there understands. At times hilarious and silly, Multiples Illuminated is also poignant and heart-warming, getting to the real deal of this twin stuff, such as the stress it can have on your marriage or partnership, navigating the delicate dynamics of inclusion and individualism as well as the daunting challenge of toilet training two at once. Also delving into such topics as having one twin with special needs or health issues, single parenting multiples and how to handle a world that consistently views twins as one person with two bodies, there is something for every parent of multiples to connect with and appreciate. The most significant underlying theme in Multiples Illuminated is the varying degrees but overall consistency of the twin mom guilt I alluded to before. Since day one it has gnawed at me, as I held my teeny-tiny newborn in the NICU, all wrapped up in her cords and trying not to tear out her feeding tube. Her sister let out a peep from the isolette across the room, signaling it was almost her turn to eat. My heart ached to just scoop them both up and never put them back down, never wanting either of them to feel as though they were second best or less important. The reality is, as many of the stories touch on, that sharing is the name of the game with twins – whether it is our attention, their toys or experiences, it is the one thing that will be a constant in our lives from here on out. And for them, our multiples, it is all they have ever known after coming into this world with a built-in sidekick (or punching bag, depending on how well they get along). It is our job to make sure this hand they've been dealt goes as smoothly as possible. Every day we fight a battle of making sure no one feels less loved or supported, all while trying to maintain our own sanity, when in reality it's likely a losing battle. They were two people, born together, destined to compete no matter how hard we try. Thankfully, Multiples Illuminated is chock full of tips and tricks to ease the stress. One of my favorite quotes, from writer Pamela Alma Weymouth, describes it perfectly: “Today, there's not a day that goes by when I'm not playing peacemaker, teaching negotiation skills, slicing fruit into equal parts, measuring out juice, then comparing the two glasses with a microscope to make sure the levels are equal.” My girls are not yet at the stage of “but she got more!” but I already make sure everything is split evenly as much as possible in a desperate attempt to stave off more feelings of guilt. I found myself laughing out loud more than a few times and constantly nodding along as each writer's words rang true in my heart. Each story illustrates one of the numerous frustrations and joys of life as a parent of multiples; it is clear the writers dug deep to share these tales in the hope that they will help others – and I believe they will. I already feel better about the dreaded threenager stage we're entering and have more ideas to facilitate their individuality in a world where the most common question we receive is, "Do they have their own personalities?" As a twin mom and writer I am often asked for advice by other soon-to-be moms of multiples. From now on one of my suggestions will be to read this fantastic book. Whether your twins are still in-utero or headed off to kindergarten this fall, you will find something in this collection that eases a worry or puts a smile on your face. And we all know how important that is in this wild world of multiples! Click here to order your copy of Multiples Illuminated: Life with Twins and Triplets, the Toddler to Tween Years today. Click here for the Kindle version. So glad you enjoyed the book, Maigen! Thank you for such a thoughtful review and appreciative words!